(Hamakua Coast, Hawai’i) – From the road, in the Laupahoehoe Section of the Hilo Forest Reserve, Steve Bergfeld of the Hawai’i Department of Land and Natural Resources spots the enormous, towering, ōhiʻa tree; its thick branches now completely without leaves. 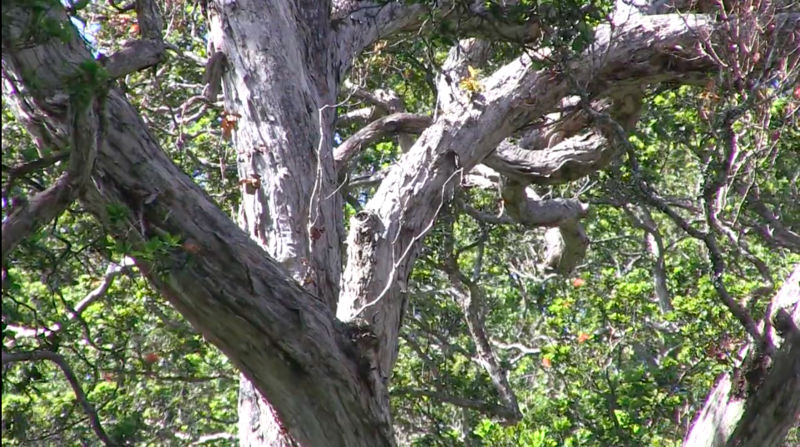 The Hawai’i Island Branch Manager for the DLNR Division of Forestry and Wildlife wants to get a close-up look at the tree, after a technician first spotted it and took samples a week ago. Two laboratory tests have confirmed that this very old tree was killed by the fast-moving fungal infection known as Rapid ʻŌhiʻa Death. collaboration between state and federal government agencies and conservation organizations is actively researching the cause of the disease, potential treatments, and the establishment of quarantines and protocols to prevent further spread. The identification of this diseased tree is the latest example of this cooperative effort. The tree was spotted by a technician from the U.S. Forest Service’s Institute of Pacific Island Forestry, who collected the wood samples for lab testing. Verification of Rapid ʻŌhiʻa Death, as the trees cause of death, was done by the U.S. Dept. of Agriculture’s Pacific Basin Agricultural Research Center in Hilo. An entomologist from the University of Hawai’i’s College of Tropical Agriculture and Human Resources Extension Service also collected samples for research that suggests beetles are a primary cause for the spread of the fungus. Bergfeld explains the next steps involving experts from the Rapid ʻŌhiʻa Death working group. “We’ll put everyone’s heads together and see what the best management strategy will be for this particular tree. I assume, more than likely, we’ll fell the tree to get it out of the forest and cover it with tarps to keep insects from putting out frass (the powdery refuse or fragile perforated wood produced by the activity of boring insects), into the air,” he said. entire koa trees during rare, unexplained outbreaks. 9 a.m. – 3 p.m. in the Capitol Auditorium. More information on this to follow.